In a bygone era of cheap solvent, transfer machinery, and Per Combo filters and cooker stills a drip was generally no big deal. However, the increasing costs of solvent and energy, coupled with environmental regulations, should markedly sharpen our maintenance and housekeeping practices. In the following few articles I’ll highlight some easily-accomplished checks and procedures to identify and rectify common problems. Stills have them, drycleaning machines have them, dryers have them, pumps have them, everywhere you look in a drycleaning plant you find them. They’re everywhere. GASKETS, that’s what I’m talking about! With this in mind, I’m dedicating the next few articles to the selecting, maintaining, and replacing the ubiquitous device we often taken for granted, the lowly gasket. Beginning with the drycleaning machine we find what are probably the four most recognizable gaskets you deal with on a daily basis; the loading door, button trap door, lint trap door (on many drycleaning machines the lint and button trap are enclosed in the same housing) and still door. These doors are opened and closed on a regular basis causing wear and failure of the gaskets designed to seal them shut. Even the most unaware operator cannot long ignore a solvent leak at the loading door. However, you’d be surprised at how few operators take the time to go behind the machine with a good flashlight and observe the still door during heavy distillation. In many cases a grungy still waste container sits under the still door and the surrounding area is often caked with old still residue. Because of this, even large leaks can go undetected if the timing and lighting are not opportune (the price of solvent being what it is, these liquid type leaks cost big money). Also, because of the heat and chemistry, sight glasses in stills have a high rate of failure and when faulty can leak prodigious quantities of solvent. 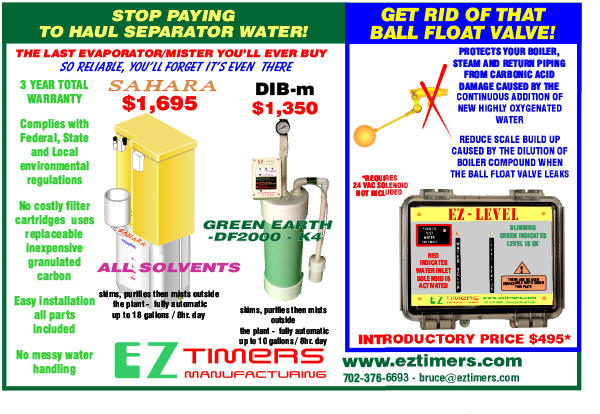 Lint and button trap leaks are usually of the vapor variety and harder to locate. Now that you are aware of the problem areas let’s explore them one by one and see how you can isolate the leaking area and stop the fluid loss. When you notice a solvent leak at a door it will almost always appear that the bottom area of the door gasket is at fault. That’s because, gravity being what it is, the liquid solvent leaking past the gasket rolls down the surface of the door and drips off of the bottom center. When you see a leak like this you need to take action at the end of the load that’s currently being processed or, in the case of a still, the next time the still is cold. Not to worry, chances are good a simple fix will get you back on track. When the door can be safely opened, look at the surface of the gasket. 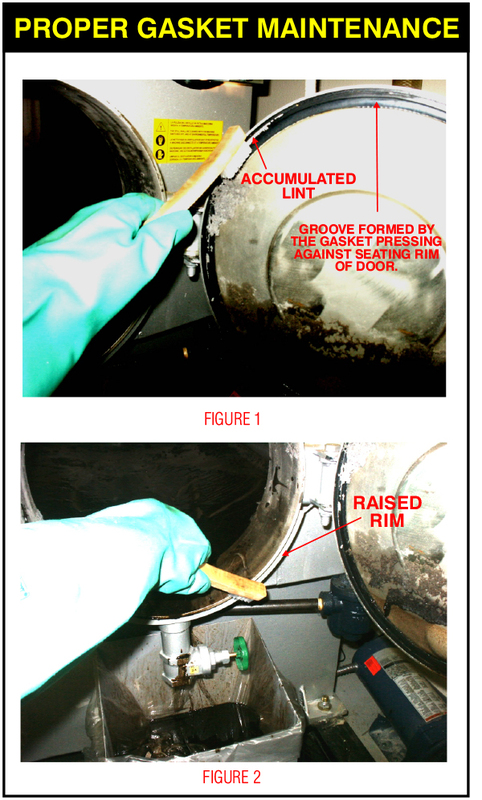 Generally, there will be a slight groove in the gasket caused by the pressure against the raised rim portion on the drycleaning machine that the door seals against (see figure 1). Often lint accumulates in this groove and prevents the proper mating of the gasket against the machine front. It is a vital to routinely clean this groove, keeping it free from lint. Also, the surface of the raised rim (see figure 2) where the gasket seats must be kept lint free. On newer machines the rubber of this gasket is a solid robust type and can be cleaned easily with a small wire brush (if the gasket is a type of foam use something more delicate like a spotting bone). The photographs accompanying this article show how to clean the still door gasket. The same procedure holds true for all the doors on the machine. A spotting brush is shown cleaning the gasket as well. In many cases the bristles may be too soft to remove caked on lint. Brushes with brass or stainless bristles can be used on solid rubber gaskets. Operate the machine and see if the leak has stopped. If the door still leaks after cleaning the gasket you have a choice to make. Do you want to order a new gasket for replacement or spend the time and effort to attempt an adjustment to the door and/or gasket in order to effect a repair? Hate to leave you hanging, but that’s it for this issue. Next issue I’ll be covering types of gaskets and how to adjust and/or replace them.